1. Spray nonstick skillet with cooking spray and heat until hot. 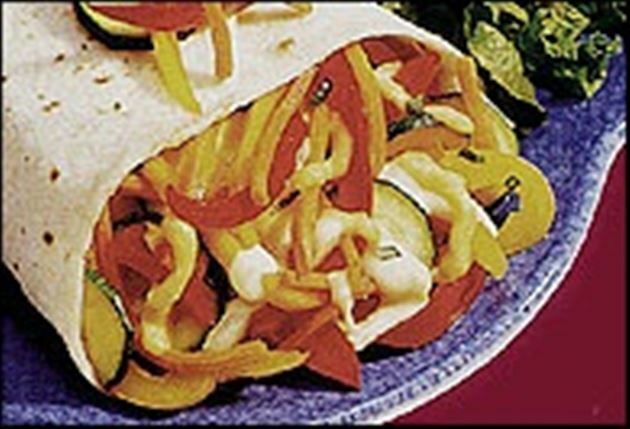 Add zucchini, carrots, onion and peppers; stir-fry 2 to 3 minutes or until vegetables are tender-crisp. Stir in basil. 2. Divide stir-fry among each tortilla. Sprinkle with cheese and roll up burrito style. Cut burrito in half and serve warm. Enjoy this delicious veggie cheese pizza wrap Mexican recipe!